My 18-year-old goddaughter, Veronika, was recently in town for the weekend and I noticed something pretty interesting that I’m still trying to figure out. Although she was raised bilingual by my (Peruvian) sister and her father, who is Cuban, (but moved to New York as a toddler and thus speaks more English than Spanish,) ever since I can remember, we have always communicated in English. I mean, I know she understands Spanish, but when I talk to her, she has always answered me in English–no matter which language I use. So, I was pretty surprised when I noticed that whenever she talked to my daughter, her cousin Vanessa, she addressed her in Spanish. Why? I didn’t really get around to asking her, but I think it’s because she probably thinks–rightly so–that Vanessa understands Spanish better, unlike everyone else in our bilingual family. 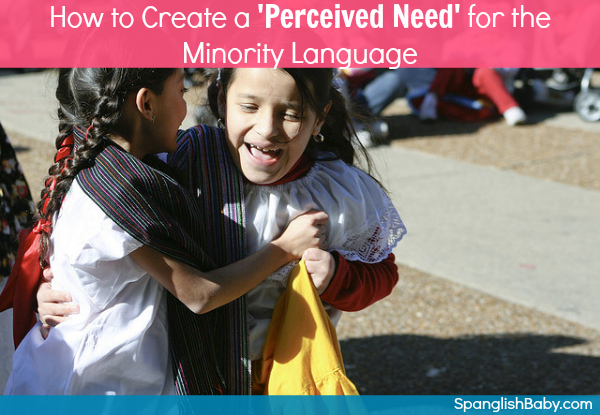 Either way, all this got me thinking about how the topic of how to get your children to speak the minority language continues to be one of the most popular ones since we started SpanglishBaby more than half a year ago. The evidence is in the questions we continue to get for our Ask an Expert series, including this week’s question, the comments in the forums and just the stuff we hear whenever the subject of raising bilingual kids comes up. 1) Show them you’re proud of minority language + culture: If your children see you take pride in your language and your culture, they will follow suit. I saw this happen before my very own eyes with my stepson. His father, my husband, is extremely proud to be Puerto Rican. He has always spoken highly of his beloved Island, its music, its food, its folklore. He owns a vast collection of Puerto Rican music which he plays on a regular basis. My stepson, although born and raised in Miami, has always identified himself with his father’s home country. 2) Give your friends and your kids’ friends a taste of the minority culture: This goes along with the first tip, except it takes it a little farther. Now, and until October 15th, it’s the perfect time to do this by celebrating Hispanic Heritage Month with a party–especially if you happen to be from one of the countries which celebrates its Independence during this time. You could serve traditional food from your Latin American country and teach the children a few words in Spanish. Again, if your children see that you’re proud of your heritage, they will be too! 3) Invite your family/friends who speak the minority language to stay with you: This works well especially if there are children involved. My cousin, her husband and their 10-year-old daughter are coming from Mexico to spend Christmas with us this year, and I couldn’t be happier. Not only do I get to see them and show-off Colorado’s winter wonderland, but my daughter, Vanessa, will spend about 10 days surrounded by Spanish coming from people other than her father and I. In other words, she’ll experience first-hand how important it is for her to speak Spanish, so she can communicate with her family. 4) Expose your children to the minority language + culture first-hand: Traveling to a country where the minority language is spoken is probably one of the best ways to create a perceived need. Although it’s sad that both my husband’s and my family is dispersed in different Latin American countries, it does gives us the opportunity to go visit them, allowing our daughter to be immersed in the language while spending time with her family. Our plans are that once Vanessa is old enough, she will spend her summers with her cousins in Puerto Rico. We did this with my now 19-year-old stepson as he was growing up, and I’m convinced this is one of the major reasons he is bilingual today. Not only will this kind of trip help reinforce the minority language, but Vanessa will get to experience the culture of her father first-hand. Great post! I too remember my visits back home to El Salvador as a child. I would come back speaking spanish (words my mom had forgotten or used in a long time) and all my cousins here wold even notice my new accent and words. I really have those trips to thank for getting spanish to stick. I’d love to hear everyone’s thoughts on creating a perceived need for Spanish in families that aren’t from any sort of Spanish-speaking cultural background. We’re located in an area with almost no Spanish speakers, making it even more difficult. We are making it a point to travel to Spanish-speaking countries, but I’m still kind of constantly scrambling to find ways to give a 4, 9, and & 11 year old any sense of needing to speak Spanish (other than with me). Great post. Creating a need for kids to speak Spanish is not always easy. I do think that when they are little – up tp 5, I would say – it is a little easier to instill the need to speak the language. .-= Stefania´s last blog ..Window of Opportunity /t/ =-. Tricia…would you mind sending this as a question for one of our experts? You have a very valid point and I´d love to see what they think. My children attend public school while we visit the country of the minority language, in (my) hope that they will make friends and realize that the minority language is also a “play” language, not just the one that adults use. So far, I have had pretty good results, i.e. when we come back home my children usually have a little correspondence with the class they attended or the children they met (mind you, it dies off after a while, usually because the minority language kids lose interest and, admittedly, my children are a little young (4 & 6) to pursue this kind of interest for an extended period of time). … just throwing out another idea. Great article, lots of useful tips which I’ll try to put into practice. There’s also an award for you over at my blog. .-= cartside´s last blog ..5 tags, 2 memes, 10 memories, 35 answers, 2×5 blogs =-. Just wanted to say that you have some amazing content on your blog. If it’s OK I wants to use some with the information you provided on my web site. If I link back to your web site would it be OK to do so? Just test the posting. Thanks! And delete please. A great and easy solution to get followers on your own Facebook business page would be to create a contest.